After a major break-up, the last thing on your mind is dating someone new. When you experience a break-up, it is important to mourn the loss of the relationship on your own, while leaning on your loved ones for support. One of the hardest aspects of a break-up is being alone with your difficult thoughts and intense emotions. However, sitting in those tough times and getting through them makes you more resilient and allows you to mourn the relationship, which is necessary to move forward in a healthy manner. Getting over a break-up can take anywhere between a handful of months to over a year, depending on the relationship, its impact on you, and how it ended The amount of time that has passed is not nearly as important as how you are feeling day to day and about your past relationship. 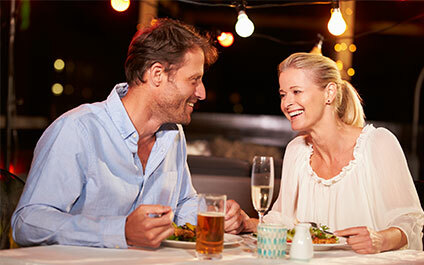 While it may be tempting to start dating sooner to have a distraction, it will be important to go slow and ease your way into the dating scene. But how will you know when you’re ready to start dating? This is a question I get often and is very difficult to answer because it does not necessarily have logic behind it: it’s a gut feeling. If you are still very sad, angry, upset, frustrated, and so forth, it is likely that you are not ready to date someone new. If you are still thinking about your ex-partner on a daily basis (or many times throughout the day), it may be too soon. It is necessary to process your past relationship by thinking about what the relationship meant to you, what did you learn from the relationship, did you learn anything about yourself from the relationship, have you learned more about what you are looking for, what did you like and not like about the relationship? Questions like these should be reflected on over a period of time. If you are able to reflect on these questions without becoming extremely overwhelmed with sadness and anger, you can take that as a sign of moving forward and growth. Once you are starting to feel more like yourself, and everything around you doesn’t always remind you of your ex, it may be time to start thinking about dating (if that’s important to you). There is nothing wrong with wanting to be single for a period of time to learn more about yourself and work on self-growth. However, many people may want to find other partners to date, especially if it is important for them to get married and start a family soon. Even if you are feeling pressure from yourself, your friends and family, and society to find another partner and settle down as soon as possible, fight that pressure and listen to your inner-voice that will tell you when you feel ready to meet new people again. It won’t do anyone any good if you start dating again before you are ready. When thinking about jumping into the dating pool, it is important to reflect on expectations. It will be important to think about when the last time you dated was and how dating has changed since then. Ask your single friends about their experiences, especially if you have never tried online or mobile dating. Dating may feel very foreign and scary. You may have assumptions about how dating based on your past experiences. Maybe you think it’ll be a piece of cake because you never had issues attracted potential partners in the past, or maybe you are worried because it took you a long time to find your last partner. Be aware of what your assumptions and expectations are, and do your best to go into dating with an open mind and a neutral attitude. It may be wise to dip your toe into the dating pool before diving in head-first. Go out with one person and see how it goes. Did you think about your ex the whole time? Could you not help but compare this person to your ex? Did the date make you more sad and anxious because it reminded you of your break-up? If you answer “yes” to these, it is totally normal and OK to feel this way, but it may also be a reminder from your gut telling you that you may not be ready. If you answer “no” or “a little” to these questions, you are on the the path to moving forward. Fight the urge to be hard on yourself for not being over your ex or not being able to meet someone else great. Coping and moving forward from a break-up can take a long time, and it is a process that cannot be rushed through. Patience will be a necessary tool during this time period. It is very possible that you may not like the first handful of people you go out with, or you may find that you are more picky than you realized. Relationships will not fall into your lap, nor should they. Great relationships take time to form and do not appear overnight. If you are having trouble coping with a break-up and need a space to discuss the break-up and self-growth, contact a therapist at Symmetry Counseling to set up an appointment with a therapist. Through therapy, you will not only have the space to process your break-up, but you will also understand how the break-up happened and how to prevent falling into old patterns in your next relationship.